Alongside with the Hohensalzburg Fortress and the Salzburger Dom, the Residenz Palace is probably the most important historic building of Salzburg. This Baroque palace was the official residence of the Prince Archbishops of Salzburg until it was secularised and became part of Austria. 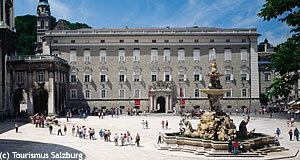 What was formally simply a bishop′s palace stood on the location of today′s Residenz since about 1120. This court was altered repeatedly in the 15th and 16th century. The current building is mostly what Prince Archbishop Wolf Dietrich von Raitenau started around 1600, when he performed major changes of the original Residenz buildings. Under Wolf Dietrich′s reign, the main courts, the Residenzplatz Square and the Domplatz Square, the Carabinierisaal Hall, and the arcade connections to the Franziskanerkirche Church as well as the so-called "Dietrichsruh" building. The wings towards the Alter Markt Square and the Churfürstenstraße as well as the Residenzplatz wing were started under the rule of Prince Archbishop Markus Sittikus. Promotional Video for the Residenz Palace, done by the Tourist Info Office. Prince Archbishop Guidobald Graf Thun (1654 to 1668) added a floor to the main building in order to allow the Residenz Palace to blend in visually with the Salzburger Dom. Around 1710, the façade was renewed under Prince Archbishop Franz Anton Harrach according to a design by Johann Lucas von Hildebrandt. Prince Archbishop Hieronymus Colloredo planned to rebuild the western wings in Neo-classicist style, but only the Toskanatrakt wing was altered. The destruction of the Franziskanerkirche Church and parts of the "Dietrichsruh" building was not done due to the high costs of the project. During the 19th century, the Residenz Palace was temporarily used as a private palace by some members of the Austrian royal family as well as the line of Habsburg-Toskana. Today, the Residenz Palace contains the art collection "Residenzgalerie" and is used by the University of Salzburg as well as the Salzburg Festival, but can also be rented for private occasions. Prince Archbishop Hieronymus Colloredo ordered the erection of the Toskanatrakt wing buildings to replace former wings from the time of Prince Archbishop Wolf Dietrich von Raitenau. The Toskanatrakt′s façade bears decorations around the windows that date back to the late 18th century. The northern wing consists of arcades with ionic pillars that span two floors and were built in the early 17th century. The south-east corner dates back to the first building period of the Residenz Palace and contains a staircase and stucco work from around 1600. The so-called "Steinsaal" hall in the first floor contains elaborate stucco decorations from the 18th and 19th century. The "Toskana Appartement" (Tuscany apartment) in the second floor contains a ceiling and walls with stucco work from 1862. The Toskanatrakt is used by the law faculty of Salzburg University, so don′t be surprised to find it full with blondes in Lacoste polos and tanned guys in Barbour jackets trying hard to look smart. The Carabinierisaal and Rittersaal Halls are the two most important halls for representative purposes in the Residenz Palace. They are also called "Prunkräume", or "glorious rooms" (State Apartments) and can be visited with audio guides. The Carabinierisaal Hall was used as a common room for the Prince Archbishop′s bodyguards, but also for theatre and banquettes or balls. It was initially built in 1600, but enlarged in 1660 and newly decorated in 1689. The elaborate stucco work was made by Francesco and Carlo A. Brenno and Antonio Carabelli in 1689. The three paintings on the ceiling depict representations of the four elements and were painted by J. M. Rottmayr in 1689: Neptun rules over the wind (water and air), the Calydonian hunt for boars (earth) and the workshop of Vulcanus (fire). The smaller artworks in the corners represent the four gods of wind. The four gates are made of marble and date back to around 1610. Bordering to the Carabinierisaal, you will find the Rittersaal with paintings on the ceiling depicting scenes from the life of Alexander the Great. These were painted by J. M. Rottmayr, too, in 1714. The main work depicts the taming of the horse Bukephalos by Alexander. Over the mantelpieces you plastic allegories and armour trophies. A gate towards East dates back to 1770 and connects the Residenz Palace with the Salzburger Dom. The Wallistrakt connects the Residenz Palace with a pillar hall over the Franziskanergasse alley. It was built in 1606 and extended with another floor in 1690. The only original wing contains a two-store hall with a central pillar in Tuscany style that was taken from the old cathedral. On the northern side of the Wallistrakt one can see two Roman mosaics from the 3rd century. They were found here during renovation work took place in 1964 and 1965 and added to the arcades. Today, the Residenz Palace hosts an art gallery mostly with Baroque paintings; the gallery can be visited separately from the palace and is maintained as a museum - it is described in an own article.